Your Noko account name is used as the first part of the URL (web address) you and your fellow team members (and contractors!) can use it to sign in to Noko, though you can always login directly on nokotime.com without having to know the account name. It's also part of the web address that Noko provides to you when you share invoices or reports with clients. Giving every Noko account its own web address has several advantages, most importantly it means that you can stay signed in to multiple Noko accounts at the same time, for example if you're a contractor with one company and also have your own Noko account. Did you name your Noko account “rocking” in the heat of the moment but now you want to change your account’s name to “awesome” because that’s what you really are? Easy! Careful! Changing the account name will invalidate all invoice links and shared report links shared with customers. All existing bookmarks you may have created (for example for the Noko Timer) and any API integrations you or any of the users of your Noko account have configured will be invalidated and will have to be recreated. Anyone connected via the Noko iPhone or Mac app will have to sign in again. Sign in to your Noko account as the Account Owner. Go to Plans & Billing in the green navigation sidebar. Enter your new account name! 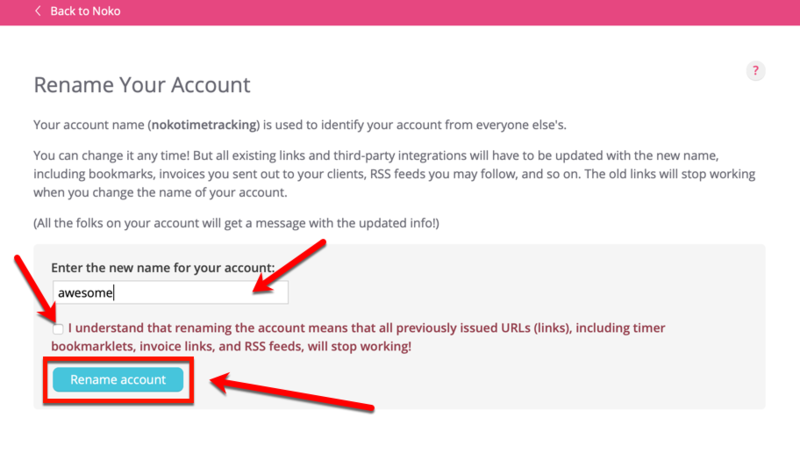 Read and click the check box to indicate you understand what changing your account name does. Click the blue Rename account button! We will send an email to all existing users in your Noko account about the change, listing the new URL to sign in with. We don't send this email to archived users, and you will have to contact clients that you shared invoices or reports with on your own.